The ceramic fondue maker is perfect for any celebration, dinner party, gathering, or a romantic night for two. Whether it's a sweet summer evening or cold winter weather, the Fondue Gouda will melt everyone's heart. Keep your chocolate, cheese, broth or tapas warm with just a tea light. This set comes with ceramic pot, base, 4 fondue forks, heated by a candle. A convenient kitchen piece for any great host; easy to assemble and clean. 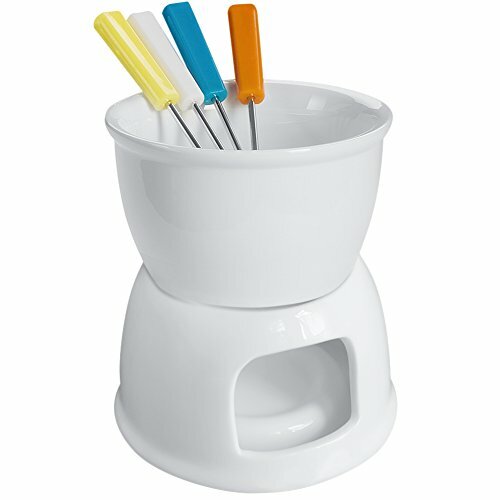 Tebery white fondue set are absolute design Smooth finish, beautiful addition to any cafe, restaurant, definitely to your own home. Pick out your favorite fondue cheese or chocolate, experiment, and enjoy with your friends.